Judging by the great response I got for my Scrap Busting Cowl Free Knitting Pattern, you guys must also have a lot of yarn you want to use up! 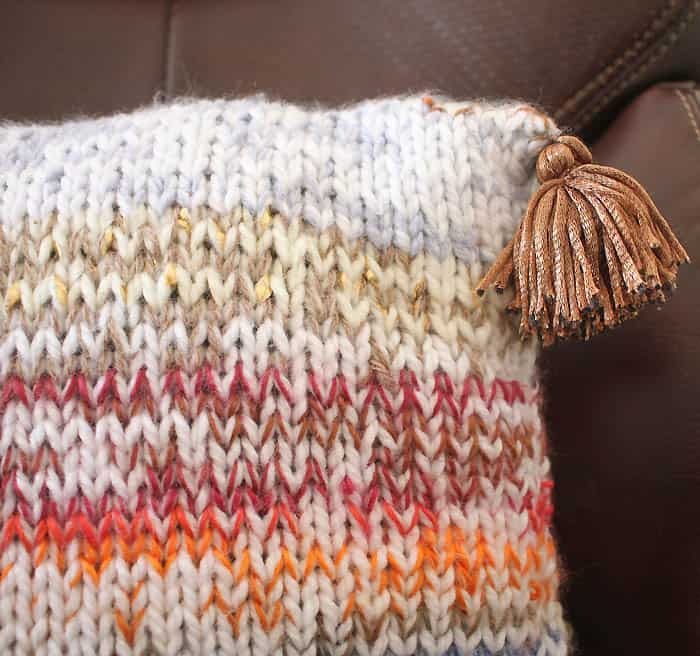 My latest Scrap Busting project is this Tassel Pillow. It’s knit using 2 different weight yarns at the same time (1 bulky, 1 worsted) When you run out of a yarn scrap, just tie on another. I had a bunch of white, bulky yarn so I used that as the base for the pillow and added different color worsted yarns as I knitted. You can adjust this pattern for any size pillow. 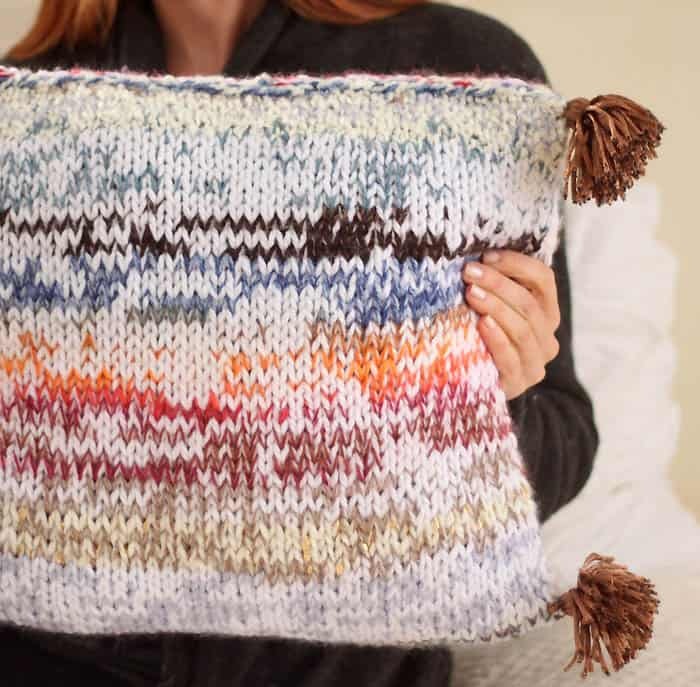 I had a 15 x 15 pillow that didn’t go with my decor anymore so I used it as the filler for my knitted pillow. You could also just use fiber fill to stuff the pillow. 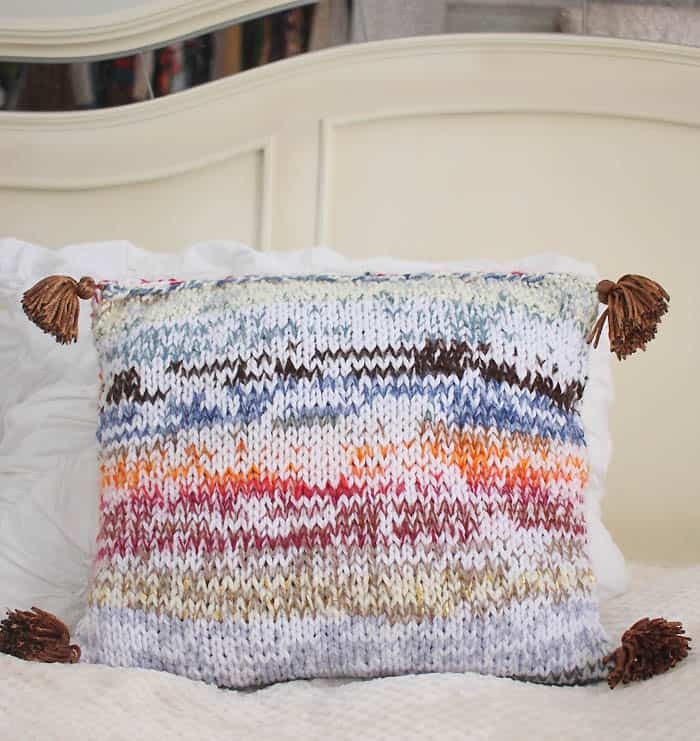 I’m really pleased with the way this pillow came out and it made a sizeable dent in my scrap yarn bin. I’m definitely going to make a few more of these in the near future! Using 2 strands of yarn (1 bulky, 1 worsted) at the same time, cast on 45 sts. Work in Stockinette Stitch until piece measures 30 inches. Add new strands of yarn as you run out. Bind off. To finish: Fold the piece over and sew together at the bottom. Sew one side closed. Insert your pillow or fiber fill and sew the other seam closed. Make an attach tassels to the corners. If you don’t know how to make a tassel, check out my Perfect Tassel Tutorial. Want more Scrap Busting Free Knitting Patterns? Gina, you are a genius! I was hoping to find a way to use the scraps without wasting them! My knitting buddies said no way! they had enough scraps of their own! Thanks for some great ideas for charity knitting!